When one is faced with hard times, it is always hard to keep faith and hope, but with inspiration and role models like James “Rhio” O’Conner, hope and faith will be the last thing we lose. Mr. O’Connor was diagnosed with Pleural Mesothelioma on October 2001. His Physician gave him less than a year to live, and suggested him to enjoy what was left of his live with his family. Mr. O’Connor rejected the idea, and instead looked at improving his diagnosis by eating a healthier diet, taking supplements, and practicing mind-body medicine. 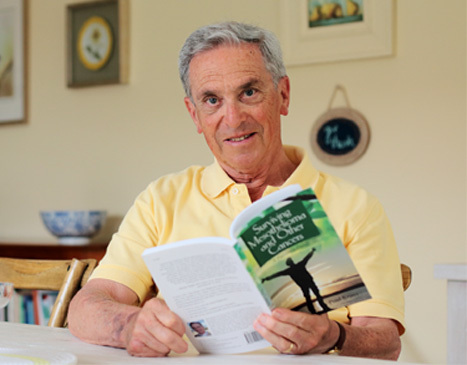 Mr. O’Connor broke all expectations and lived for seven and a half years with Mesothelioma. He passed away on July 11, 2009. Pleural Mesothelioma is a rare type of cancer that occurs in the cells of the lining of the protective sac covering the lungs. Although it is uncommon, over the past years the United States has seen an increase in diagnosis. It is predominantly cause by inhaling asbestos which become embedded in the lining of the protective sac, causing damage and resulting in cancer. Because it sometimes takes more than ten years to appear after exposure, it is difficult to diagnose and it does not respond well to treatment. In many cases physicians advise their patients that instead of opting for surgery, chemotherapy or radiation they should focus on managing their pain, and spend time with their love ones. If I like Mr. O’Connor was diagnosed with an incurable cancer, today I would try everything to find a way to outlive that prognosis, but the truth is that before reading and learning about Mr. O’Connor I would have probably done what my physician advised, to spend what was left of my life with my family. Mr. O’Connor has been an inspiration to me, and I now see him as a role model to follow. For this reason today I say that I would do everything in my hands to outlive that prognosis. Like him I would look at improving my diet, taking supplements and practicing mind-body medicine, but I would also look into other medical treatments available through my physician. If I was diagnosed with cancer I would start out by focusing on my diet and nutrients. What we put into our body is what we are, therefore it is very important to eat a natural diet that is chemical free and good for our immune system. I would start out by eating all organic and locally grown food which will make all the food I eat chemical free and more fresh. I would also go vegetarian focusing on eating a lot of fish and vegetables, cutting out all “junk” food because they would not add any nutritional value to my diet. After working with my diet, I would look into taking supplements like Mr. O’Connor did. Many of the nutrients our body needs in order to function at a maximum are not produced constantly in our bodies; therefore it is very important to take them orally. I would look into taking vitamins, amino acids, herbs, vegetable and fruit products because like a natural diet these supplements will make my immune system stronger and better at fighting the cancer. Like Mr. O’Connor I would also look into Mind-Body Medicine. This type of treatment focus on the way mental, spiritual and behavioral factors directly affect our health. Because our mind is a powerful element of our body it is very important to have faith and hope that one can be truly cured. Mind-Body Medicine focuses on using tools like meditation, guided imagery, breathing and movement, self expression through words and drawing to live a healthy life. To have a healthy mind-body relationship I would start out by practicing yoga, and meditation every day. I would also try to leave the cities’ stresses at least once a week by going to a natural place like the mountains or ocean. This will help me live a stress less life, therefore making my mind stronger, and better at helping my body fight the cancer. Apart from taking these measures to keep my body and mind strong to fight the cancer, I would also try to work with my physician on coming out with other treatment plans available to me. I believe that is very important to ask a lot of questions to be one hundred percent informed of everything available for cancer patients. Some of the available new treatments for cancer include; chemotherapy regimens, Monoclonal Antibodies, growth factor inhibitors, cancer vaccines and gene therapy. Before I take any of these alternative treatments into mind I would start by asking these very important questions; can these treatments cause other problem such as heart, lung or kidney damage? What are the immediate side effects? Where are these treatments available? Are they available in my city or will I have to travel to another city? and will these treatments be covered by my insurance or will I have to pay for them out of my own pocket? When looking into these treatments one has to be very well informed of which treatment fits into our lifestyle. Chemotherapy Regimes work by combining existing chemotherapy drugs to better fight your type, and stage of cancer. Monoclonal Antibodies are designed to travel to the site of the cancer and release the drug or radiation there. They are designed to target only cancer cells making the immediate side effects like hair lose less severe. Growth factor inhibitors are drugs designed to block the effects of the growth factors in cancer cells. These drugs help stop cancerous cells from growing quickly and spread throughout other parts of your body. Cancer vaccines use the body’s immune system to fight the cancer by engineering cancer cells so that they are no longer cancerous, but still contain components the immune system will recognize as foreign. The theory is that by introducing small amounts of the vaccine, the body’s immune system will mount a defense against it. It is important to know that these vaccines are still not available to the public, but that I will be able to participate in clinical trial where the vaccines are being tested. Gene Therapy on the other hand is a good way to help scientist learn more about the genetic changes in cancer cells. I will be able to provide some of my cancerous cells for scientists who are working to design ways to correct these changes. I believe it is important for cancer patients to know that they can also contribute to the fight against cancer. Mr. O’Connor reminds us that there may be other ways to beat cancer beyond chemotherapy, radiation and surgery. He looked into improving his diet by eating all natural, he took supplements to help his immune system, and he practiced mind-body medicine. But most importantly Mr. O’Connor reminds us that “without faith a man can do nothing; with it all things are possible”. On the eve of his one year death anniversary, Mr. O’Connor will be remembered as a man that didn’t give up, and as a man of hope and faith who broke all expectations. He will forever be an inspirational figure and a role model for many, including myself.